Moving house is a chore. Many new homeowners are wrapped up in moving efforts, closing expenses, arranging removalists that they tend to overlook the fundamentally important task of having their new home rekeyed. Many homeowners are unfortunately unaware or even misled by agents and sellers about the exact state of their door-ware or key system in their new home. 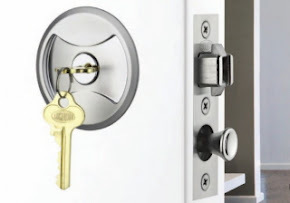 Many residents are unaware that home construction companies will purchase their locks and door-ware in bulk from manufacturers and distributors directly, and all those locks will be purposefully keyed to that construction companies internal master key system. This allows the construction company to only hand out 1 key for all their properties everywhere and allows their construction tradespeople to access all the different and separate properties they may be working on, without scrambling to find each separate sites individual key. Pictured here is a typical pin tumbler cylinder showing the components used in it's build out. The important attribute is the bottom pins. These are the pins that correspond to the cuts on your keys. In the above picture you can see the essential components of a typical pin tumbler cylinder. The little holes to the left of the primary bottom pin holes, are for construction keying. Construction keying is a process that some manufacturers use to build specific sets of locksets for different builders. At the end of the construction phase, the new homeowner will usually insert their individual key in each keyhole and turn. That first turn of the key, will drop some ball bearings into the holes, thereby preventing the old construction key from operating in future. However, in my many years practising the locksmith trade, I have found time and time again, that many homeowners delay or forget to rekey their locks upon taking possession of their new abode. In the picture here, you can see a typical mock up of a master keyed cylinder. You will notice a set of master pins between the bottom pins and the top pins. These master pins enable multiple differing keys to potentially operate in your keyhole, effectively reducing the security of your door locks. For a business or residence that wants to restrict key holders from operating certain particular door locks, without handing out or using separate keys, usually they will ask for their locks to be master keyed to a unique master key system. But, all too often I see in the field, many circumstances where a lock has been master keyed and then the new resident or dweller will be unaware of such and live with it in oblivion to the potential disaster awaiting them. Just last week, we attended a commercial customer (who had obviously contacted another company to rekey their locks). This customer has been using us for a number of years, but obviously someone else decided to use a competitor. 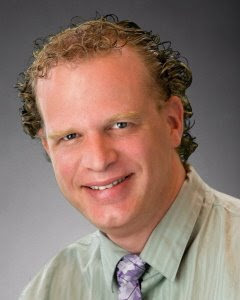 I have no qualms about any customer using their choice of professional, but I do draw the line at improper or mischievous techniques those "other" service companies might employ. The 4 keyholes I rekeyed, actually were master keyed, unbeknowest to the store manager. 2 of the four keyholes included multiple master pins in each chamber, indicating that a significant number of differing keys also operated those locks. Again, without the knowledge of the store manager or corporate management. Besides this important detail being overlooked, the other 2 keyholes had pin tumblers missing completely from their chambers, effectively eliminating virtually any security for the particular locks. 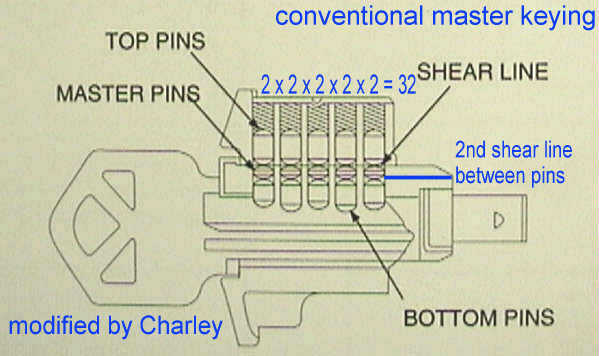 Besides these plugs (cylinders) missing some pins and having multiple master pins in a few chambers, the plug itself (the barrel you put the key in), the top of the barrel had been filed. 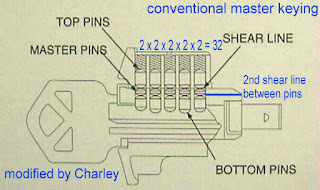 That single act alone, of filing the barrel, renders an already flawed cylinder even less secure because now, multiple differing keys, including some keys that may be completely different, will operate these locks. Kwikset in recent years, altered the design of their mainstream lock cylinders to their new Smartkey system. 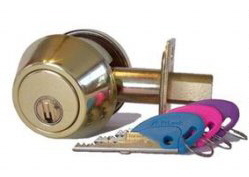 A system that allows the customer to rekey their own locks as desired. The new Smartkey locks CANNOT be master keyed. When master keyed locks are requested, we recommend customers to purchase a high-security restricted key profile to prevent unauthorised duplication of keys. This will protect a resident or business from those who would surreptitiously duplicate keys for nefarious purposes. Our recent visit to the Assa-Abloy Lockwood Australia headquarters and original manufacturing facility in Huntingdale, Victoria, Australia allowed us to see in person many of the companies new products being manufactured and assembled. One of their new products we viewed is the new Cortex Digital Door Lock. This product differs from competing products because it is available for narrow stile aluminum, steel or wooden doors, standard dimension, aluminum, steel or wooden doors using the Lockwood 5782 Narrow stile door mechanism or the Lockwood 3772 Standard stile mechanism. The narrow stile Lockwood 5782 mechanism allows for typical shopfront aluminum doors to enjoy a stand alone electronic digital access control device. The standard stile Lockwood 3772 mortise lock allows typical doors fitted with mortise locks to also enjoy electronic digital access control. 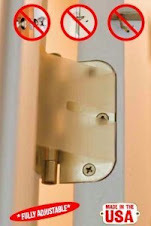 The narrow stile or standard stile door locks also include 3 options for gaining access. Keyed (by way of the exterior key cylinder), PIN code, by way of the touch screen keypad and Card access by way of the built in card reader. The PIN code digital touchscreen allows for up to 20 individual separate PIN codes to be programmed while the Card controller allows for up to 40 individual cards to control the lock. The added benefit of a mechanical door key allows for high-security key cylinders to be included. This enables mechanical key entry (if the batteries are flat), but there is also a 9 volt battery connection on the bottom of the unit to allow temporary power for a non-keyed user to gain entry to a flat battery unit. Lockwood also make a version that uses a typical tie-bolt entrance set latch mechanism, allowing typical residential or commercial lever or knob entrance sets to also enjoy the benefits of electronic digital, PIN or Card access control. As there is a 9 volt battery terminal on the exterior, there is no need for the mechanical key cylinder on the Lockwood CTX530. The video above shows how easily programmed the product is.